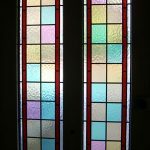 Stained glass photos of windows and doors from around the UK and the world. 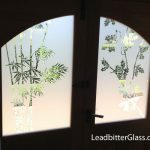 The Leadbitter Glass studio did not create these actual jobs but these photos may help you choose a design and style that is right for you. 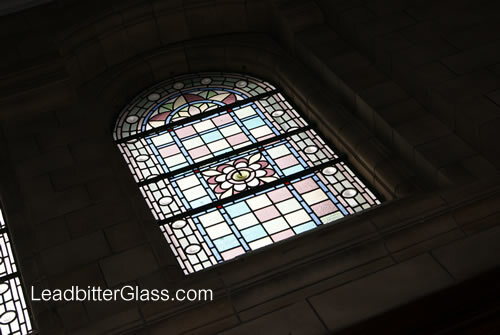 We can use these patterns and styles to create windows and doors in your specific glass sizes. 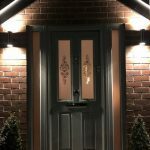 This door entryway is a great example of how a basic design can be used to add a lot of colour to a hallway and create an attractive feature to a home or business. 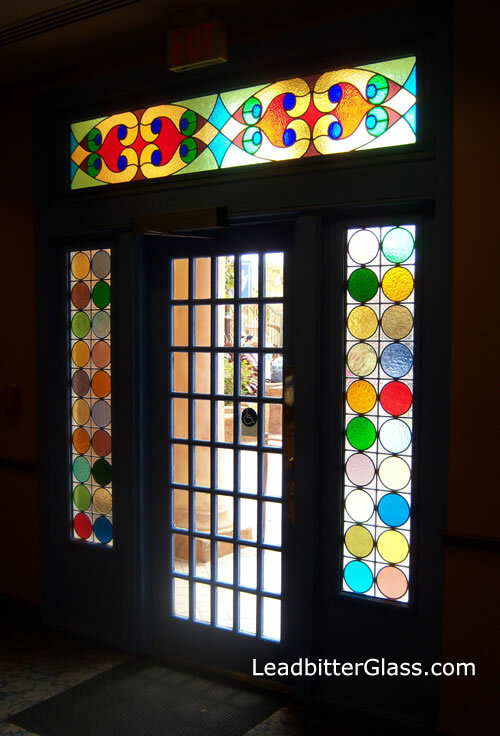 This door is the entrance to the guest relations department at Universal Orlando Resorts – Islands Of Adventure theme park in Orlando Florida. 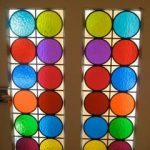 We can create this style of design using our Overlay Stained Glass product of which there are hundreds of colours to choose from. 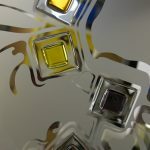 We can create this glass design using Stippolyte or Minster textured glass from this page and we can create the glass in single glazed form or double glazed sealed units. We have already completed numerous orders based on the side panels in this photograph for clients around the UK. 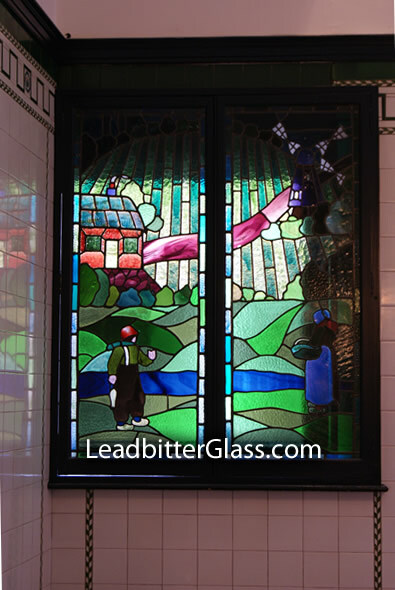 This Leaded Glass country scene featuring roaming hills and a windmill is located in a restaurant in Covent Garden in London. Our studio has created many landscape scenes down the years and you can view some of our gallery images of our original landscapes here. Our studio can create a featyre window based on any landscape scene and we can even create designs from photographs of the countryside should you prefer. 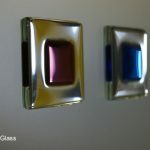 There are no limits as to what can be achieved with decorative glass for your home or even your business. 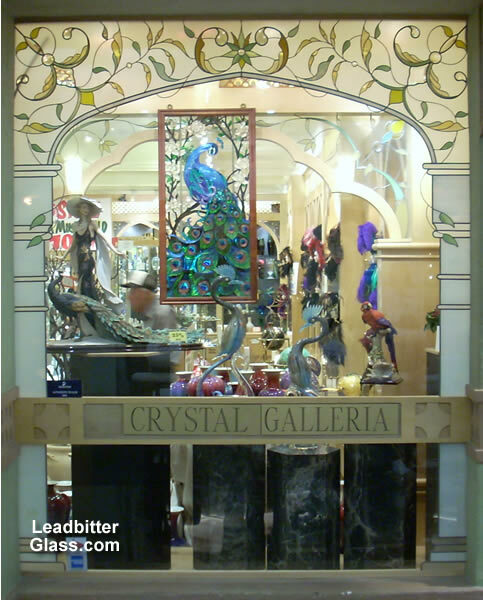 We spotted this window in a high end gift store in a Las Vegas hotel and as you can see it really compliments this type of retail premises. 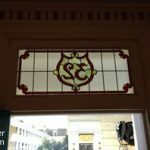 The overlay stained glass leadwork at the sides of the window has been created to portray stone pillars and with the leaded and bevelled arch design above, this gives a real elegant feel to the store without over-complicating the window. 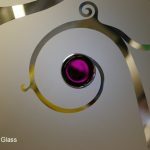 The design was manufactured using decorative coloured film glass and glass bevels along with standard leadwork. 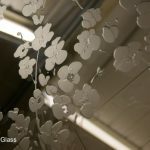 Leadbitter Glass can design, manufacture and deliver decorative glass similar to this design or any design you desire for use in your retail premises. 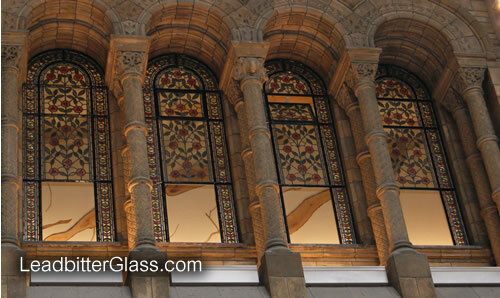 The British Natural History Museum in London is a great place to view some beautiful glass as well as the museum pieces on show. 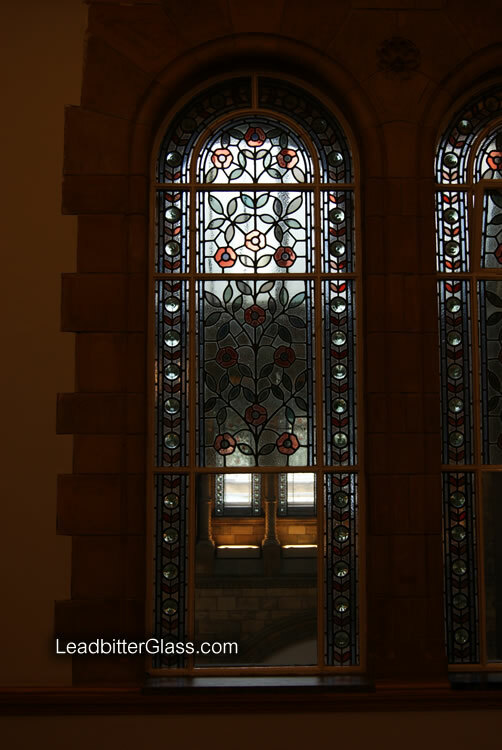 These windows are just a couple of the many feature windows on display in the museum and it is probably well over 100 years old. 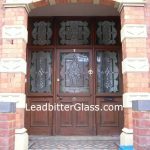 The Leadbitter Glass Studio can create a very similar style feature window using our aged and soldered lead, along with our clear glass roundels. 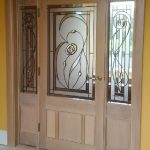 This leaded glass design can be used to create arched windows or standard rectangle shaped windows.